A picture is worth a thousand words, and populating your pages and blog posts with relevant artwork is important for both SEO and aesthetics. 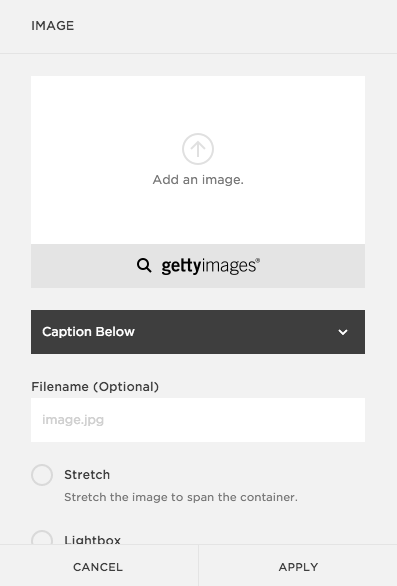 Even if you aren’t a great photographer, Squarespace’s Getty library puts thousands of images at your fingertips for a very affordable price. The Squarespace Image Block enables you to add one image at a time (20 MB or smaller) to a page or blog post. If you’d like to add a gallery of images, you should use the Gallery Block instead. Image layout is essential to maintaining the look and feel of your Squarespace site. If you have a special circumstance that requires image or layout customization, we’d be glad to help! Begin by selecting the Image Block from the Basic Block options and place it into the desired content area on your website. As with any Squarespace Block, the Image Block can be repositioned and resized within your content area. Once you add your image to the Image Block, you can decide whether or not to display a caption in two styles: image overlay or below image. The captions can also have links to files, content within your website, or external sites, as with any other link. You can also select to stretch the image to fit the block, or choose the lightbox option that enables visitors to click and enlarge the image. This is an example caption area.